The two lungs are the vital organs of respiration. They are situated on either side of the mediastinum, surrounded by the right and left pleural cavities. Their main function is to oxygenate the blood. This is done by bringing the inspired air into close relation with the venous blood present in the pulmonary capillaries. The pulmonary arteries deliver deoxygenated blood to the lungs from the heart's right ventricle, while oxygenated blood returns to the heart's left atrium via the pulmonary veins. 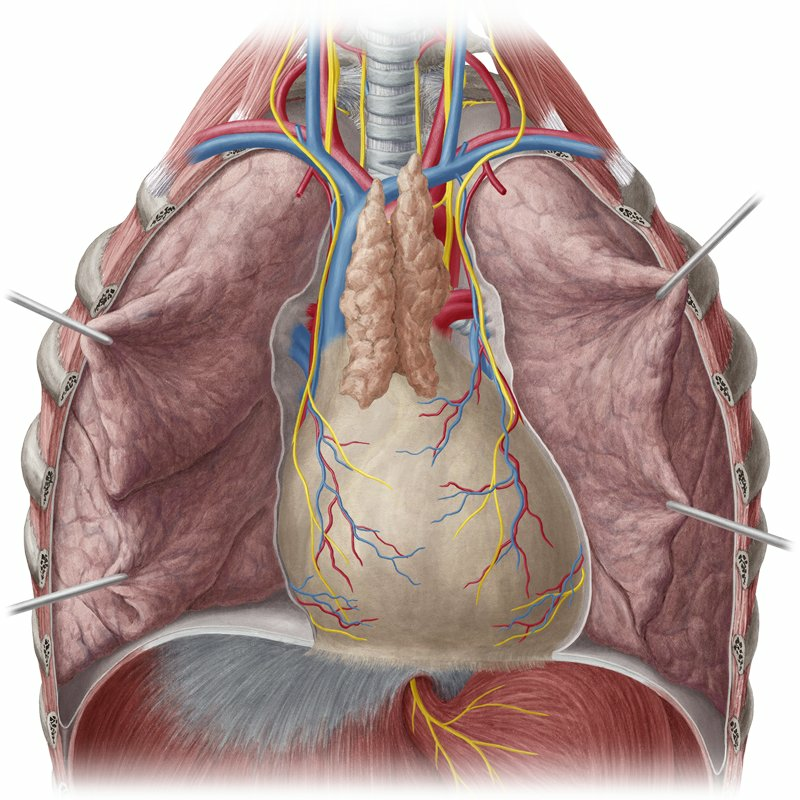 The air enters and leaves the lungs through the main bronchi, which are branches of the trachea. These bronchi further subdivide into lobar, and then segmental bronchi, ultimately leading to the bronchioles. The lungs have a half cone shape, each consisting of a base, apex, three surfaces, and three borders. The base of each lung is semilunar and concave. They sit on the superior surface of the diaphragm, which separates the right lung from the right lobe of the liver, and the left lung from the left lobe of the liver, stomach and spleen. The apex is the rounded superior end of the lung. It protrudes above the thoracic inlet, and into the root of the neck. It is covered by cervical pleura. The three surfaces of the lungs are the costal, diaphragmatic and mediastinal (medial) surfaces. The costal surface lies immediately adjacent to the ribs and intercostal spaces of the thoracic wall, while the mediastinal surface lies anteriorly against the mediastinum, and posteriorly against the vertebral column. The mediastinal surface contains the hilum, which permits structures to enter and leave the lung. The root of the lung is a tubular collection of structures located at the hilum. It attaches the lung to the structures present in the mediastinum. The diaphraghmatic surface lies on top of the diaphragm. Both lungs have three borders. The inferior border is thin and sharp; it separates the base from the costal surface. The posterior border is blunter; it separates the costal surface from the mediastinum. The anterior border is also thin and sharp. It overlaps the pericardium, and like the posterior border, it separates the costal and mediastinal surfaces. The right lung is divided by the oblique and horizontal fissures into superior, inferior, and middle lobes. These lobes are freely mobile against each other due to the visceral pleura invaginations that form the two fissures. The medial side of the right lung lies adjacent to a number of important structures, and they include: the heart, the superior and inferior vena cava, the azygos vein, and the esophagus. The left lung is divided by the oblique fissure into two lobes only. Its medial surface lies adjacent to the heart, the aortic arch, the thoracic aorta, and the esophagus. The right lung is slightly bigger than the left because of the bulging of the middle mediastinum towards the left. The right and left pulmonary arteries, originating from the pulmonary trunk, are responsible for the lungs’ arterial supply. The venous drainage is carried out by the superior and inferior pulmonary veins on each side. These veins start at the hilum and continue through the root of the lung to drain directly into the left atrium. Moreover, the bronchial arteries and veins form the nutritive vascular system for the pulmonary tissues. The lungs are innervated by the pulmonary plexus via preganglionic parasympathetic fibers originating from the vagus nerve (CN X) and postganglionic sympathetic fibers originating from the sympathetic trunk. Want to learn more about the Lungs? Lungs in situ seen from the anterior view. Structures seen on the medial views of the right and left lungs. Structures seen on the lateral views of the right and left lungs. Structures of the trachea and the bronchi seen from the anterior and posterior views. Lymph nodes and vessels of the lungs.